This is a simple and low cost wide band VHF field strength meter. The field strength is measured by converting the radio signal to DC and measuring it. The RF signal will be picked up by the coil and rectified by the diode D1.Even a very small DC voltage is sufficient to alter the biasing of FET and it will be reflected in the meter as an indication of the presence of a radio signal. The meter can be calibrated by adjusting the preset R2 to make meter M1 read ZERO in the absence of any radio signal. This circuit is not very sensitive, but can sense radio signals from hand held FM transmitters up to a distance of few meters( ideal for theoretical demonstrations). Use a 250uA FSD current meter for M1.Using a lower FSD meter will improve sensitivity. The coil L1 can be made by making 6 turns of 20 SWG enameled copper wire on a Â¼ inch plastic former. The antenna can be a telescopic whip antenna. plz, l need ur help in building electromagnetic radiation meter that can measure frequency range from 50Hz to 30GHz and also the output will be digit of 16by4 LCD display. Hi Olawuyi this is wide band VHF field strength meter responding to entire VHF band of frequencies. 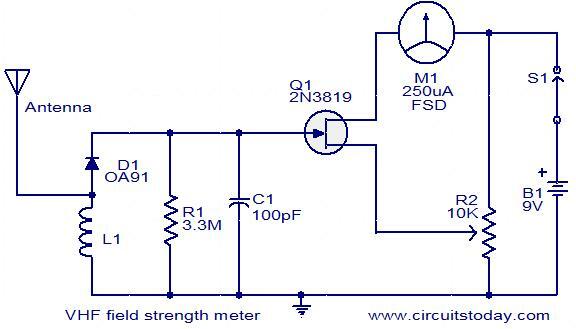 Hi Akeredolu this circuit can respond to both FM and AM field strength. which frequency range you want to cover. L1 alone requires replacement for different range of frequencies. We are working in a project for the same I require your kind assistance. what help u need vasanth?